A PCR-mutagenesis strategy for rapid detection of mutations in codon 634 of the retproto-oncogene related to MEN 2A. Multiple endocrine neoplasias type 2A (MEN 2A) is a dominantly inherited cancer syndrome. Missence mutations in the codon encoding cysteine 634 of the ret proto-oncogene have been found in 85% of the MEN 2A families. The main tumour type always present in MEN 2A is medullar thyroid carcinoma (MTC). Only 25% of all MTC are hereditary, and generally they are identified by a careful family history. However, some familial MTCs are not easily detected by this means and underdiagnosis of MEN 2A is suspected. DNA samples from MEN 2A patients were amplified by PCR. The products were incubated with the restriction enzyme Bst ApI or Bgl I. The samples were loaded in non-denaturing 10% Polyacrilamyde Gel and run at 120 volts for 40 min. The gels were stained with 10 μg/ml ethidium bromide, and the bands were visualized under a UV lamp. We developed a PCR-mutagenic method to check the integrity of the three bases of the cysteine 634 codon. The method can be used to detect inherited mutations in MTC patients without a clear family history. The method is relatively simple to use as a routine test in these patients to decrease the underdiagnosis of MEN 2A. In addition, the assay can be used to screen affected families with any mutation in cysteine 634. Multiple endocrine neoplasia type 2A (MEN 2A) is a dominantly inherited cancer syndrome, which involves the triad of medullary thyroid cancer (MTC), pheochromocytoma, and hyperparathyroidism. It is inherited as an autosomal dominant trait. Missense mutations in the codon encoding cysteine 634 of the ret proto-oncogene have been found in 85% of the reported families . Other mutations in the same cysteine-rich domain of the protein can also cause MEN 2A. All these mutations lead to the replacement of a cysteine by an alternate amino acid. The ret gene is expressed in neural crest derived tissues . It encodes a receptor with tyrosine kinase activity that is essential for the normal development of the kidneys and the intestinal nervous system . This protein is considered a dependence receptor because it provokes proliferation in the presence of its ligand, and cell death in its absence [4, 5]. The mutations associated with MEN 2A cause ligand-independent constitutive activation of the tyrosine kinase receptor by the formation of disulfide-bonded homodimers [6–9]. The main tumour type always present in MEN-2A is MTC, accompanied in 50% of the cases by pheocromocytoma and in 15–30% by parathyroid hyperplasia. MTC arises from the proliferation of parafollicular or C cells of the thyroid. About 25% of all MTCs are hereditary, the remainder are sporadic. At present, hereditary MTC is identified mainly by a careful analysis of the family history. However, about 15–20% of the patients with familial MTC do not have a clear hereditary history, a pheochromocytoma or any other condition that would clearly indicate the familial background of the disease (personal communication, Oliver Gimm). This means that about 5% off all patients with MTC have hereditary MTC that cannot be identified by the analysis of the family history. Higher underdiagnosis of hereditary cases would be expected in developing countries due to poor family information and lack of routine mutation analysis in MTC patients. Since the ret proto-oncogene has a "hot-spot" site at the codon 634 in exon 11, the aim of our group has been to develop a PCR-directed mutagenesis strategy to test the integrity of this codon. The assay is relatively simple and can be applied as a routine analysis for MTC patients and to screen MEN 2A affected families. DNA samples of MEN 2A patients that had been previously diagnosed as carriers of a hereditary mutation were used . DNA was extracted from 3 ml of entire blood using the saline extraction procedure . The PCR primers used were, 5'ATCCACTGTGCGGCAAGCTG (forward) and 5'AAGAGGACAGCGGCTGCGATGCCCGTGCG (reverse). The PCR programme consisted of 30 cycles of 94°C 30 sec, 55°C 2 min and 72°C 30 sec, with an initial and final hold of 94°C 3 min, and 72°C 3 min, respectively. PCR products were incubated with 0.5 μl of Bst ApI (10 U/μl New England Biolabs, Buenos Aires, Argentina) or Bgl I (10 U/μl Promega, Buenos Aires, Argentina), in a 25 μl reaction volume. The same reaction replacing the enzyme with miliQwater was used as negative control. Incubation with the Bgl I enzyme was performed for 2 h at 37°C; incubation with the BstApI enzyme was performed for 4 h at 60°C, and 1 μl of enzyme was added to each tube for a second 4 h incubation at 60°C. The samples were loaded in non-denaturing 10% Polyacrilamyde Gel and ran at 120 volt for 40 min. The gels were stained with 10 μg/ml ethidium bromide, and the bands were visualized under a UV lamp. Our goal was to design a strategy in which the PCR product would contain the 634 codon and one (or more) restriction sites present only in the wild type allele. The codon 634 (TGC) and its neighbouring nucleotides do not form a palindromic site for any restriction enzyme. Two restriction sites were created introducing point mutations with the PCR primers. The restriction site introduced with the forward primer is cut by BstApI and is disturbed by mutations in any of the three bases of the codon. The second restriction site is generated with the reverse primer and is recognized by BglI. Any mutation in the last two bases of the codon alters this restriction site (Fig 1). Design of the mutagenic primers, and the restriction sites of the BstApI and BglI enzymes. Four different DNA samples were amplified, a wild type sample, and three DNAs each with one of the three bases of the 634 codon mutated (TGC to CGC, TAC or TGG). Preliminary assays showed that only partial cut of the wild type allele was observed after incubation with the BstApI enzyme for 4 h at 60°C. A second incubation adding fresh enzyme rendered a total cut of the wild type allele (Fig. 2). In general, DNA samples from MEN 2A patients are heterozygous carrying a wild type allele and a mutated allele. Fig. 2 shows that, in these samples, BstApI can cut only a small proportion of the PCR product. Most of the product is not cut because the enzyme fails to recognize not only the mutated strains but also the heteroduplex formed between the mutated and the wild type strains that hybridizes during the PCR amplification. Check of the integrity of codon 634 with the BstApI enzyme. 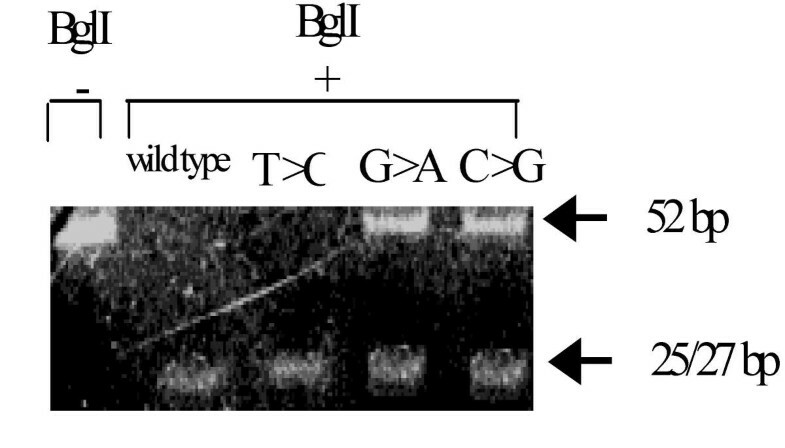 DNA samples were amplified using the forward and reverse primers shown in figure 1. The PCR product was incubated in the presence (lane 1–4) or absence (lane 5) of BstApI. The restriction fragments were run in a non-denaturing 10% PAGE. Lane 1: mutation in the first base of the 634 codon (T>C); lane 2: mutation in the second base of the 634 codon (G>A); lane 3: mutation in the third base of the 634 codon (C>G); lane 4: wild type 634 codon; lane 5: wild type 634 codon without enzyme incubation. Both alleles are completely cut by the enzyme in the wildtype codon, which means that the codon is correct. In the rest of the samples, the product is not completely cut, which reveals that one allele is mutated at one of the three bases of codon 634. 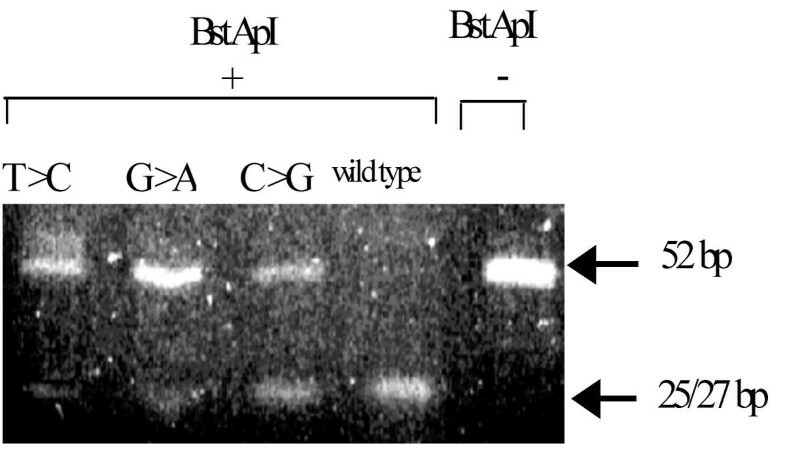 The same PCR-products incubated with the Bgl I enzyme were completely digested only in the case of the wild type DNA or when the mutation was present in the first base (Fig. 3). Check of the integrity of codon 634 with the Bgl I enzyme. DNA samples were amplified using forward and reverse primers shown in figure 1. The PCR product was incubated in the presence (lane 2–5) or absence (lane 1) of Bgl I. The restriction fragments were run in a non-denaturing 10% PAGE. Lane 1: wild type 634 codon without enzyme incubation ; lane 2: wild type 634 codon ; lane 3: mutation in the first base of the 634 codon (T>C); lane 4: mutation in the second base of the 634 codon (G>A); lane 5: mutation in the third base of the 634 codon (C>G). Both alleles are completely cut by the enzyme in lane 2 and 3, which means that at least the second and third bases of the codon are correct. In lane 4 and 5, the product is not completely cut, which reveals that one allele has a mutation at the second or third base of codon 634. The results show that the complete 634 codon can be checked by a PCR amplification and an incubation with BstApI. The incubation with the BglI enzyme permits a double-check for mutations in the last two bases. Products that are not recognized by BstApI but are cut by BglI are likely mutated in the first base of the 634 codon. Several mutations in the 634 codon related to MEN 2A create recognition sites for restriction endonucleases. Therefore, the analysis of restriction fragments has been extensively used to screen MEN 2A-affected families. However, in these studies, the mutations present in the families were first identified by sequencing the exon 11 in an affected member of the family. In a second step, if the mutation introduced a restriction site, a PCR based restriction analysis was designed to screen the rest of the family. The method that is described in this report checks (or double-checks) the integrity of the three bases of the 634 codon. Therefore, it can be used to detect mutations in MTC patients without a clear family history and to screen affected families with any mutation in the 634 hot-spot. If a mutation is detected, the necessary following step is to sequence the region and confirm which base is altered. This will avoid to mis-diagnose the polymorphism TGC>TGT, that would be detected by our strategy as a mutation, but that still codifies for a cystein,. The method is relatively simple to be used as a routine detection method for ret proto-oncogene mutations in cystein 634 in the blood of MTC patients. The test would help decrease the underdiagnosis of the familial MTC that in developed countries accounts for about 5% and that is probably higher in developing countries. The method can also be applied to screen MEN 2A families and to detect somatic mutations in cysteine 634 of the ret-protooncogen in other tumors to better understand the role of this receptor in malignant proliferation . Author 1 María Roqué carried out the molecular genetic studies and drafted the manuscript. Author 2 Eduardo Pusiol and author 3 Héctor Perinetti obtained the samples of the different families with MEN 2A, and made the clinical surveillance of each case . Author 4 Clara Pott Godoy, helped in setting up the technique. Author 5, Luis Mayorga conceived the study, and participated in its design and coordination.